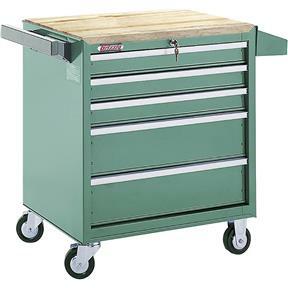 This Heavy-Duty 5 Drawer Rolling Cabinet features a one-piece 19 gauge steel cabinet body, 18 gauge steel top and bottom, quick release ball bearing drawer slides, patented locking system and a powder coated finish. Additional features include protective drawer liners, tool tray, large push handle, two fixed and two swivel casters with brake. Durable powder coated finish in "Grizzly Green"